In mythology a daughter of Zeus and Leda, whom the god visited as a swan. Helen may be shown emerging from an egg. She marries Menelaos, King of Sparta. Her abduction by Theseus and Peirithoos may be shown in archaic art, as also her rescue by her brothers, the Dioskouroi. She is awarded to Paris, prince of Troy, at the Judgement of Paris, being the most beautiful of 'mortals', and he comes to claim her, with his brother Aineias. 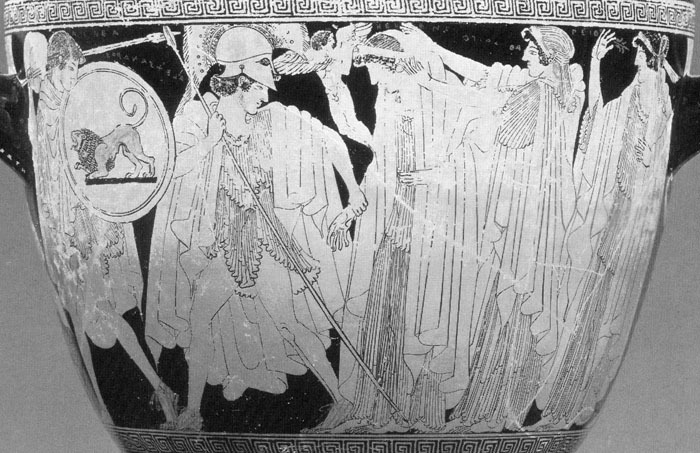 She appears rarely in any Trojan scenes except at the Sack, where she is confronted by Menelaos, who threatens to kill her but relents (dropping his sword) at the sight of her.